I recently moved to Charlottesville, Virginia. With all the packing and unpacking, and finding my way around, there’s been very little time for writing. Or sleeping. Frankly, I’m exhausted. As such, I almost switched to regular coffee. Almost. So close. I was right there. For one, I continue to carry the anticipatory self-loathing before ordering decaf at the numerous coffee shops in town (which are plentiful and surprising, more on these to come). And, like I said, I’m just tired. I could use a jolt. 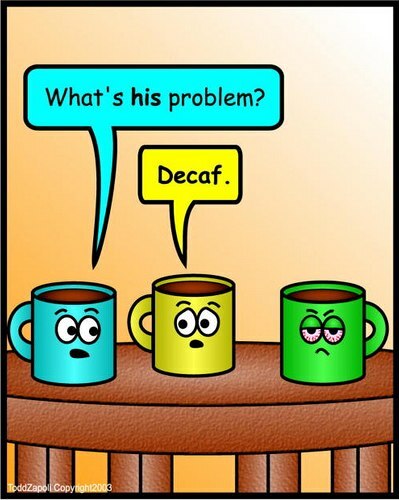 What’s the point of decaf in my life, anyway?, I’ve been wondering. No point at all. And then last week, I was innocently flipping through a magazine at the doctor’s office when I read an article saying that if you want beautiful skin (I do! ), you should lay off the caffeine. Ah ha! It’s starting to fit together. Ever since I had my daughter, who is now 4, people have commented on how nice my skin looks. Lest you think I’m being arrogant, I can’t actually tell what these people mean. To me, my skin looks the way it always looked. And I didn’t use to hear such comments. Until recently, I had always assumed the skin thing had to do with pregnancy. You know, some women find their hair curls after having a baby, where it used to be stick straight? Or other women’s feet grow? (Mine did, not a real plus, in my book.) But the skin thing: I’m starting to think it’s not the hormones, it’s the decaf. The medical studies on coffee and caffeine are mixed, as always. While caffeine has become a regular ingredient in eye creams and anti-cellulite potions because of its diuretic (read: anti-puffiness) effects, that same element seems to give some coffee-lovers bad skin. Full-caf coffee has been linked to frequent break-outs or generally dry skin. I have dry skin already, so these studies seem plausible to me. Perhaps avoiding my few cups of full-octane coffee evens out my complexion. Now, many of you coffee heroes and heroines may be balking at these claims. In fact, I may join you one of these sleepy mornings. Coffee, as we know, has many measurable and immeasurable rewards, including beneficial antioxidants. And in the end, when you want your coffee, you want your coffee. But since I’m already on the fake stuff, and I keep getting these nice compliments, I think I’m going to stick with decaf just a little while longer. And now, if you’ll excuse me, I have to finish my cup of decaf and put my apparently clear skin to bed. I’m beat.